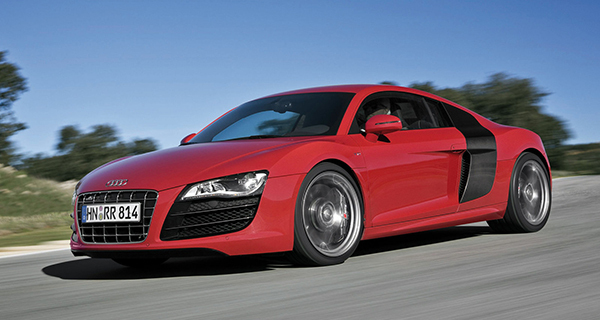 The 2010 Audi R8 is as fast as it is pretty. A clear plexiglass cover gives onlookers an eyeful of the engine bay. Easily the most eye-catching production car ever put forward by the German company, the R8 looks like it’s doing 160 km/h just sitting there. Built on the Lamborghini Gallardo platform and patterned after one of Audi’s LeMans racers, the Audi R8 was introduced at the Paris Auto Show in 2006. Initially offered as a two-door hardtop, and later as a Spyder convertible, it was an instant sensation. Easily the most eye-catching production car ever put forward by the German company, the R8 looked like it was doing 160 km/h just sitting there. In 2010, there were two engine choices: a 4.2-litre V8 and a 5.2-litre V10. These two developed 430 and 525 horsepower, respectively, making the R8 as fast as it was pretty. A clear plexiglass cover gave onlookers an eyeful of the engine bay. You could choose from a six-speed manual or R-Tronic sequential automatic transmission. Equipped with the manual gearbox, the smaller engine could hustle the R8 from zero to 100 km/h in around four seconds, the V10 slightly faster. Whatever engine you chose, the R8 came with Quattro all-wheel-drive and made absolutely glorious noises under throttle. A Ferrari-style shift gate ensured that you picked your gears carefully, and in terms of driving kicks, you got the full measure of the high-end European sports car tradition: almost zero body lean, stop-on-a-pfennig braking, virtually instant power, and a symphony of mechanical noises emanating from the engine, which was right behind the driver. One note here: despite a rearview camera and sensors, backing the car up was – and still is – an exercise in frustration. The 2010 Audi R8 has all the usual upscale bells and whistles. Heated front seats, goodly-sized pedals with a footrest, Sirius satellite radio, various choices of leather interior, climate control, a nifty aluminum shift knob, power windows and more. But it has very little storage space. The R8 had all the usual upscale bells and whistles. Heated front seats, goodly-sized pedals with a footrest, Sirius satellite radio, various choices of leather interior, climate control, a nifty aluminum shift knob, power windows and accent lighting for the engine bay, to name but a few. Audi managed to strike a nice balance between outright luxury and the minimalist ambience that’s part and parcel of the sports car experience. Behind the wheel, you could feel the car’s inner workings and mechanical rumblings. Lovely. A couple of intriguing little extras included an optional hill-holder feature and magnetic ride suspension. You could also order the distinctive Sigma carbon fibre side body “blades,” a navigation package and LED headlights. In terms of interior storage room … well, there isn’t any, despite Audi’s claim that there was “ample and convenient spaces for a wide variety of storage needs.” You could probably cram a couple of small suitcases or overnight bags behind the seats and maybe a grocery bag or two in the trunk, but that was it. The R8 was strictly a two-seater with not much room for extras. And although it’s probably a moot point, fuel economy was brutal: the 4.2-litre version, for example, delivered just 17.1 litres per 100 kilometres in town and 10.3 on the highway. No recalls are on file for the 2010 R8. But, according to the U.S. National Highway Traffic Safety Administration, the 2011 edition, which is basically the same car, may have a leaking fuel line that could chafe against an engine heat shield and ultimately lead to a fire. NHTSA also has 21 technical service bulletins on file for the 2010 R8. These include a sketchy backup camera, clogging issues with the air cleaner, low fuel pressure, engine coolant leaks and problems with the clutch mechanism. Because it was a limited production model, Consumer Reports doesn’t have much to say about the R8. Unsurprisingly, the R8 has held its value well. They tend to be in short supply and if you can find one, expect to pay anywhere from $100,000 to $110,000 for a 4.2-litre version and up to the low to mid-$150,000 range for the 5.2. Whichever model you have your eye on, this one has “collectible” written all over it.